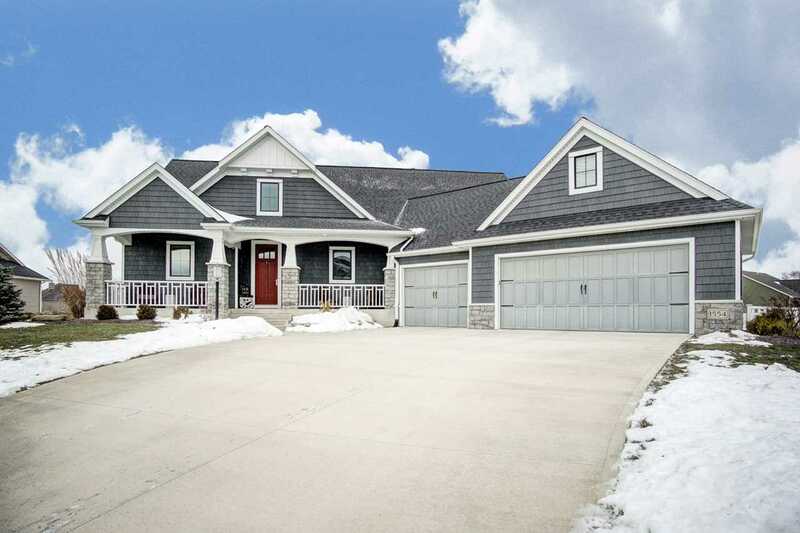 Built by Bob Buescher Homes, this is a 1 owner custom built floor plan with many upgraded features throughout. It is located in a wonderful Southwest Allen County location. With 5 bedroom, 3.5 bathrooms, a finished basement & bonus space upstairs, you will find a very spacious open concept floor plan! From the beautifully appointed great room with crown mold, hand scrapped engineered hardwood floors and gorgeous fireplace, to the fabulous custom kitchen with quartz countertops, gas cook-top, built in wall oven, oversized island, walk-in pantry and generous dining area, the plans detail & flow will captivate you. The en-suite master on the main level presents a secluded retreat complete with a tiled walk-in shower, dual cultured marble vanity with ample custom cabinetry storage, as well as a large walk-in closet. Located on the main level is a pocket office with built in desk; the perfect space for studying or working from home. Head upstairs where you will find 3 additional bedrooms, all with great closet spaces, a beautiful bathroom and a fantastic 21x14 bonus space! Heading down to the lower level, you will find a great open finished living area and a large 5th bedroom, full bathroom, plus an abundance of storage space. This home offers a sizable laundry room on the main, blinds throughout, oversized 3 car garage, pre-wiring for surround sound, a great outdoor entertainment space with covered porch and beautifully landscaped yard with fencing. Directions:West on Illinois Road past West Hamilton Road, Turn south (left) on Rock Dove (entrance to Bridgewater) and continue to Sandstone Drive, turn right to White Coral Court, turn right and home is on the left. SchoolsClick map icons below to view information for schools near 1554 White Coral Court Fort Wayne, IN 46814. Listing provided courtesy of Leah Marker, Mike Thomas Associates, Inc..